The Power of Self Expression – Skyler Elizabeth. For a long time I have contemplated making a public blog. Although, I like to write, I struggle with public expression. I would worry about the opinions of others, such as the one mentioned above. I was concerned about who would think that I’m trying to be “fake deep”, or whether or not my opinions would be well received… But really… Who cares. Expression is a vulnerability. Whether it’s writing, speaking, dancing, what you wear, or the sharing of your goals, you open up yourself to the critiques of others just by being you. What you do with this vulnerability is up to you. We are often to scared to fail. And the struggle for the acceptance is futile. Someone out there will always have something negative to say about you. But it is important to remember that the person who defines you, is well, YOU. But I believe that transparency is fundamental. And I’m not saying to give your life story to everyone you meet. There are many aspects of life that should be private. Some people will attempt to take advantage of your weaknesses and everyone doesn’t need to know your struggles. But there’s a balance we must learn to master. Sometimes self expression, or writing in my case, is like getting undressed in front of a mirror. With each item of clothing we take off, there’s a little bit more of ourselves revealed. Each line, phrase, each personal experience, drops to the floor. And sometimes we get uncomfortable. Our flaws seem to resonate much louder. But we have to be comfortable with ourselves. When you’re expressing yourself for the sake of personal expression, you are your own audience. You have to accept you for you and learn how to make yourself better. When you get undressed in front of others, things are a little bit more intimate. We’re afraid of their critiques and we want to recluse. And you shouldn’t be baring your soul to everyone. There should always be elements of mystery or surprise to you. But don’t be afraid to express yourself. Do what’s necessary to relieve your burdens. It’s not good to try to keep things bottled in. Eventually, you explode and there’s a much bigger mess to clean up. There are many things to gain through self expression. The most important being knowledge of self. Self expression isn’t for other people. 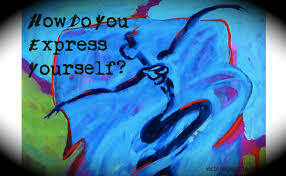 It can be an avenue to reveal yourself to the outside world, but self expression is unapologetically for you. It’s your avenue to self discovery. When you know who you are, you learn your passions. You find out what drives you. And this within itself is so rewarding on so many levels. It helps us in love, careers, and goal setting. We have to know why we do the things we do and be willing to explore our own depths. We must know how to live fulfilling lives.